Tens of thousands of Indonesian factory workers have gone on a one-day strike to demand higher wages and better working conditions. They want revisions to a law that allows companies to hire temporary workers for a year without benefits. More than two million factory workers joined the strike in 24 cities, labour union leaders say. But an official from an association of employers said that the actual number was lower. The strikers also want an increase in the minimum wage. Yoris Raweyai, head of the Confederation of the Indonesian Workers' Union, said they also oppose a proposal for workers to pay 2% of their wages toward health insurance. "Today's strike is a warning to the government to act quickly and firmly to respond to what workers want," union member Nining Elitos told Agence-France Presse news agency. "Don't blame us if workers lose patience and disrupt airports and toll roads." 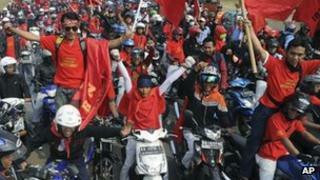 More than 700 companies were affected by the protests, police spokesman Col Agus Rianto told the Associated Press news agency. In January a court ruled that hiring contract workers without benefits was unconstitutional. A government spokesman said on Wednesday that the labour law was still being revised. Although the minimum wage in Indonesia varies depending on the province and sector, the average is still significantly lower than China's - a comparison many businessmen in Indonesia often make. The standard minimum wage in Jakarta is about $170 (£105) a month. Employer associations have warned that foreign investors will stay away from Indonesia or relocate their businesses because of the recent increase in industrial action in South East Asia's largest economy, says the BBC's Karishma Vaswani in Jakarta.